Imagine a room filled with women for women inspiring women – now that’s powerful. This past weekend we gathered together and adopted a new framework of thinking and living, one that made sure we were moving forward in life, wherever we were at. 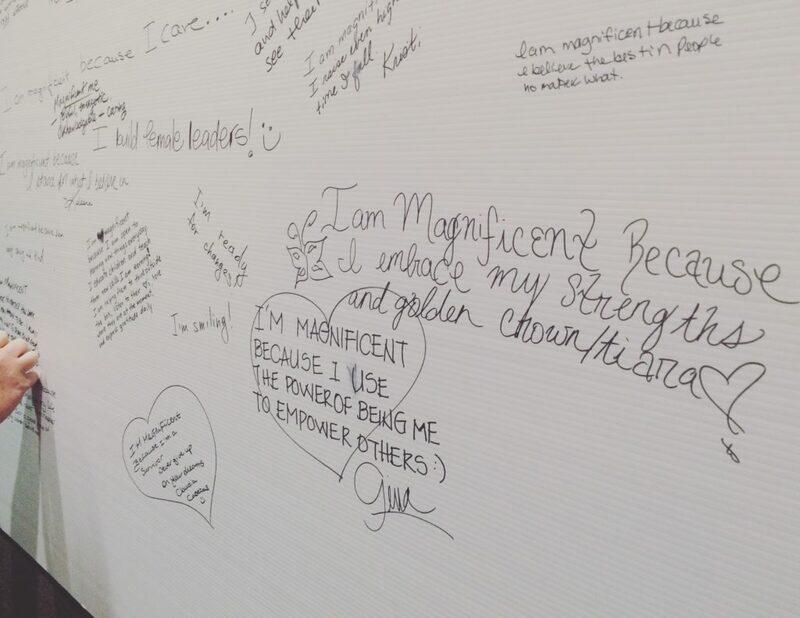 I had the honor of attending the Magnificent You- Women’s Conference this past weekend which is the brainchild of Francesca Anastasi, CEO & Founder who is also the founder of Shimmy Mob and the CEO of Confidance and it absolutely blew my mind. Both days had you bursting at the seams with inspiration and in awe of the beautiful women sharing their stories with one common goal – EMPOWERMENT. The first day left me to question – who am I? What is my authentic self? Am I running with it and rocking it? By Sunday I was given all the answers I needed with my sparkly red carpet, now I’m ready to rock anything. 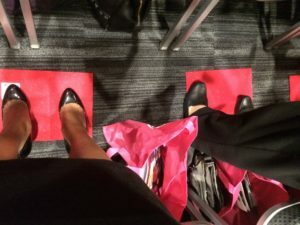 Let me explain, at the start of the conference we were given goodie bags that had red sparkly felt paper, but we call it our “red carpet” (it sounds classier). Francesca told us to put our carpet on the ground and step onto it – screaming, “I AM MAGNIFICENT!” If you believe it, you feel it, and you become it. You transform into magnificence, if you choose to. Once we stepped into magnificence the weekend began. There were so many pieces of wisdom I took from this event, but I’ll narrow it down to my top 8 highlights. 8. What is influence? How are you being perceived and seen? Jill Lublin simply said, “It’s all about the message”. The ability to have influence and cause change is by leaving a lasting positive impression on someone, and this happens from the minute you walk out the door. Influence and message go hand in hand. Be authentic and consistent with your message, and most importantly believe your message matters. 6. Branding is important. Everyone has a brand – their personal brand. It’s what defines you and is based on images and feeling people have about you. People will know you based on what you put out to them. Azadeh Yaraghi did an excellent job explaining how to find your brand identity, how do you want to be seen or heard? This is based on what your values are – your values are how you will be viewed, understood, and remembered. 5. Want to make money? Talk to money. Seriously talk to it, we wrote a letter to money, and money wrote back. This exercise can be for any entity or part of your life. Suzy Prudden taught us that everything you say and believe are affirmations. What do you want to be right now? Do you believe it? You are in charge of your own thoughts. 4. I am selfish, and it’s good. Monika Becker showed us how to realize our true potential through “good selfishness.” Make sure to care for yourself by including “me-time”. In order to fully give yourself to others, you need to recharge, reset, and practice self-love first. This is benefiting both you and the people you care about. 3. “Life doesn’t happen to you, it happens for you.” Sandra Rechsteiner shined our attention on the importance of energy. Energy is all around us, and is a big factor on how we give our time and express ourselves. Energy is your attitude to focus, be present, and your choice to be grounded every single day. It comes down to simply living life – you have nothing to lose, people don’t live for you. You make your life, you choose to be happy, and send either positive energy or negativity to others. 2. Live a life without regrets. When you stand true to yourself and stand solid in it, people support you. It takes courage, but it’s worth it. Lynn Robinson urged us to treasure every day, “it’s not just about the big stuff, it’s about the little stuff too.” Stand true to you. 1. Break the habit of living disconnected. Belonging, togetherness, and culture – this is Community. Jacky Yenga spoke about connection and belonging. We live in a westernized world, where there is a constant disconnect. We have a lot of abundance, yet we are lonely. Where do we begin to make the change? It starts from breaking disconnection – through habit. Connection and community happens from the inside out. We have to shift our way of thinking and use the power of community to create connections. The power of connection is so influential, humans want to belong and innately crave a sense of belonging. Connection itself can improve your health, motivation, and happiness. This message runs deep and true, because a Cue Creative Consulting strongly believes in the essence of community and we make sure that it is integrated in every aspect of our work. We aren’t simply a consulting company that builds your brand; we build a community for your brand, so that the people can trust you and what you stand for before they connect with you. Social media is one of those tools that we use to engage, connect, and build relationships with. Maintaining community and connections online and offline is so essential to us as individuals and this is integrated in our message at a Cue. All in all, there were definitely more than 8 lessons that I took away from this Women’s Conference, and other amazing women that spoke their stories this past weekend. I deeply encourage everyone to attend any or all of these ladies’ workshops and services! Thanks to Francesca Anastasi for creating such a powerful event, and let us all choose to walk forward into Magnificence. Alexandra is an avid snacker, with a keen eye for creativity and planning events. Upon completing her Bachelor Degree in Communications at Capilano University, she realized her true passions were in Marketing and Public Relations. She has gained valuable insight in coordinating community events, volunteering as PR and sponsorship coordinator for non-profits, and working as a Marketing Executive Assistant. She understands the need to continuously innovate with the digital world and has a particular passion for producing creative campaign strategies, and connecting a company’s individual brand and story to the public through social marketing strategies. She is now focusing her efforts as Junior Consultant at A Cue Creative Consulting.